Happy Thursday and HAPPY SHOPPING! I can't believe the biggest sale of the year is finally here and I'm so excited to be sharing some of my online shopping picks with you. I know I normally do my posts on Friday but I wanted y'all to have this little guide for shopping the sale ASAP. I plan to go to Nordstrom tonight so I can do some in-person shopping and I'm hoping to get a post detailing everything I picked up on Monday! For now, these are some of the items I have my eye on to buy online. 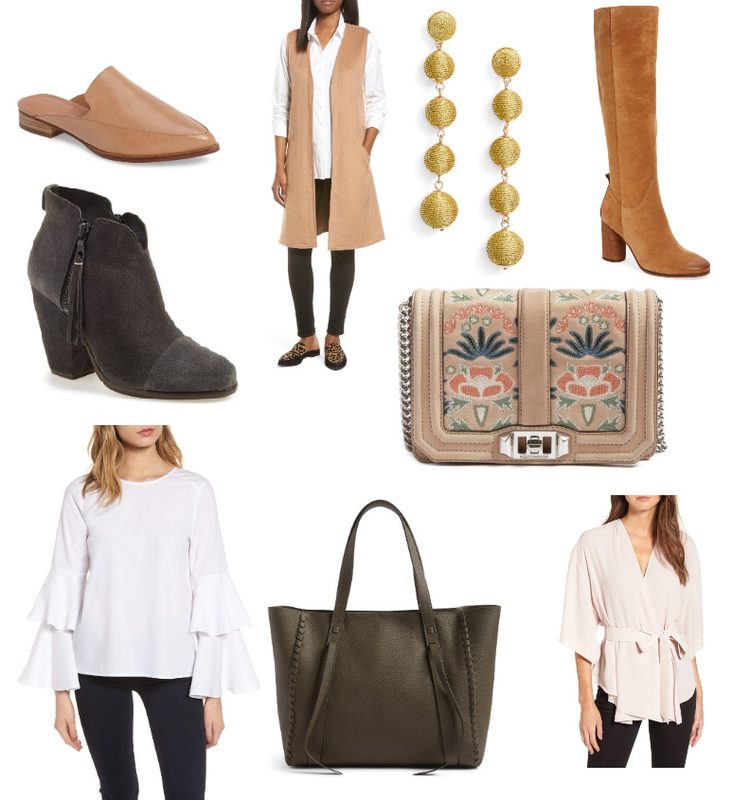 My method for shopping the Nordstrom sale is pretty much to focus on the wardrobe STAPLES that I will wear a ton through fall. Every year I pick up a pair of boots, booties and usually pick up a jacket or a staple like this gorgeous long vest. Last year I got 2 or 3 pairs of booties (oops lol) so this year I don't think I need another pair but I wanted to include this gorgeous rag & bone taupe pair that looks SUPER similar to the Vince Camuto ones I got last year. Also how GORGEOUS is this olive tote?! In the past I haven't really purchased any handbags during the sale but this one is just adorable and such a great price! Items that I want to try on in person that aren't included in this round-up are this leather jacket, these leather leggings, this cardigan, these Chelsea booties, and this blazer. This is the year I want to make the investment and buy a really good leather jacket and because they're kind of pricey I want to check them out in person to see how they fit. With leather leggings my sizing is always a toss-up so I like to try those on in person too! I feel like with this list I have all my essentials covered but I'm sure while I'm in the store a few more things will catch my eye. Stay tuned for my post Monday to see everything I tried on and purchased at the Nordstrom sale in-store! Love your picks! That wrap top is gorgeous! I am loving your picks- and this sale! It's amazing! Obsessed with all your pics! I may need that RM bag! Seriously these are the best! Those mules... that bag.... and all those tops! Love em all!